The quintessential Penguin Guide has now been in existence for close on four decades. Edward Greenfield, Robert Layton and Ivan March are all highly respected, venerable reviewers and so the recommendations in this book can be accepted with confidence. But be warned. This Yearbook is an updating of the previous year�s gargantuan Guide. Look at this Yearbook�s spine. It is only 1� inches (3 cm) wide. 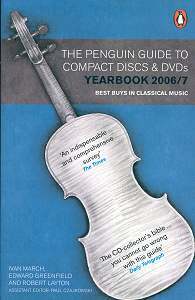 The previous full main Guide had a spine closer to 2�" (approx 6 cm) wide; it had more than twice the number of pages (over 1500), but was in the same paperback format, the same cover size, practically the same colour and almost the same design - except the new book has the violin tilted across the front cover. The last main Guide, covering a much wider choice of recommendations, was entitled, The Penguin Guide to Compact Discs & DVDs 2005/6 Edition � The Key Classical Recordings on CD, DVD and SACD. For this latest, smaller Yearbook, surely a different colour and front cover design might have been preferable? So why the need for this extra �slimline� Yearbook? It contains reviews of the immense number of new CDs and reissues including bargain and �super-bargain� CDs issued since the main Guide was last published as well as information on the very best current releases. As Ivan March, explains: "Because of the huge number of recordings now covered by our main CD Guide and this Yearbook, we have thought it essential to continue to offer our readers a selection of �Key� recordings which may be used as a basis for a personal collection." More than one choice is offered where there are attractive couplings of music available and where highly recommended versions are available on both CD and DVD. The book�s evaluation system is explained in the �Introduction�: a key icon denotes a "key recording that is suitable as a basis for a collection", then there are star ratings five stars descending to one. Very, very few recordings regarded as "really exceptional issues on every count" are awarded five stars. Some recordings are awarded a �Rosette� for "a performance that is considered to show special illumination, magic, a spiritual quality or even outstanding production values, that place it in a very special class." An eleven-page �Foreword� gives an overview of the year�s important releases and impressive additions to the recorded music repertoire plus news of artists� new projects etc. For the �not-too-serious� listener requiring guidance on best recordings this Yearbook is an invaluable �stand-alone� guide; however considering not only the increasing number of new releases and reissues, but also the not inconsiderable number of deletions, the main Guide should also be considered by the serious collector - and house room permitting, earlier editions retained for reference.